I'd have to say that everything -- every single aspect -- of Krishna consciousness attracted me. 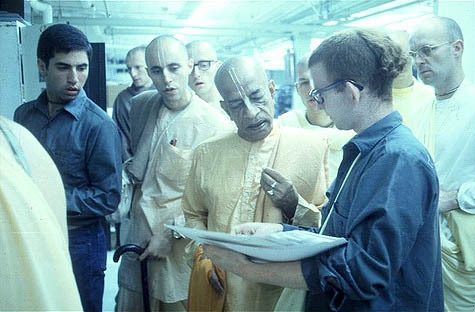 The philosophy, the kirtans, the prasadam, the sights, sounds and smells of the storefront temple, Srila Prabhupada's voice and his appearance, the devotees, the books, the paintings, the deities, the instruments ..... everything ..... struck a deep chord inside me --- drew me in --- attracted me ---- convinced me that this is where I belong and this is who I am and this is what I'm supposed to do with my life. There was a relative sense of innocence and sincerity during those days. As we know -- as soon as the conditioned soul makes a move toward Krishna, maya becomes more stringent in her efforts to keep him/her away from the spiritual world and entrapped in the illusory energy. Prabhupada covers this so nicely in "Perfection of Yoga" where he gives the example of Visvamitra Muni who was distracted from his spiritual endeavors just by hearing the tinkling ankle bells of Menaka. He united with her and they had a daughter named Shakuntala. He became enamored and then entangled in family life but eventually came to his (spiritual) senses and got back on track so to speak. Anyway --- back to what drew me in -- there were two things especially that really got my attention and convinced me. One is those words Prabhupada spoke "on chanting Hare Krishna" about "and even a dog can take part in the chanting." Especially at a time when people were being charged money to buy a mantra (my first wife Kanka spent a hundred bucks to get a mantra from Maharishi before she became a devotee and guess what she got for her money? She was told to repeat over and over ("aym gurudevaya namah"). So the fact that KC was universal and free for all and not just limited to human beings .... and the other thing was hearing the analogy about watering the root of the tree being the only real welfare work for all living beings. I remember going out chanting and thinking (and even to this day still thanks to Prabhupada) how even the flies and insects and even microscopic germs all around and hearing the sound vibration -- they are all benefitting so what to speak of the humans walking by us, staring at us, on their way shopping or to a bar or whatever, wherever. I wanted to do something that would benefit everybody and I found the way to do it. Then reading things like "Who is Crazy?" and "The Peace Formula" .... constantly reassured me that this movement -- this Krishna consciousness movement -- was the highest welfare work and the only means by which one can help all our fellow living beings. I pray that I will never lose that appreciation -- that feeling -- that confidence and faith and hope against hope. I needed to write that. Now I feel much better. Thanks.